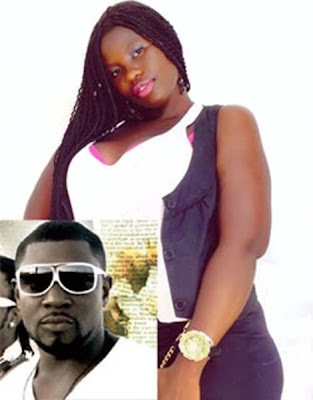 A beautiful young lady by name Priscilla Nyarko has popped up with a seven-week-old baby saying it belongs to the late hiplife musician, Ronnie Coaches of Buk Bak fame. Ronnie died last Thursday morning at the Korle Bu Teaching Hospital in Accra, and since then four women, apart from Priscilla, are claiming Ronnie was their husband. four children with four different women, he spent most of his time with Priscilla at her residence in Abeka Lapaz New Market, a suburb of Accra, and their relationship was known to everybody including friends of the late music star. ‘Beatwaves’ learnt Ronnie had been taken ill for some time, and had been seeking medical attention. Though medical report on his death has not been made public, ‘Beatwaves’ gathered some of Ronnie’s close pals were speculating that their friend left more questions than answers. However, when Priscilla was asked whether she believed Ronnie did not die a natural death, she said she did not have spiritual eyes to see what happens in the spiritual realm and so could not tell. Priscilla Nyarko, an obviously sad and worried mother of a new born baby said she was yet to come to terms with the reality that her son’s father was truly dead because she found it difficult to believe that the man whom she loved and had a baby with was no more. “I am very sad. I don’t even know what to say. I have one month three weeks old baby boy with him. He did not name his son before he died. I will always remember him…The last time I was with him in my room, Ronnie predicted his death saying he would not live to see his son grow. He knew he was going to die. It was like he knew he was never coming back from the hospital,” Priscilla said whilst breast feeding the baby boy. Priscilla admitted that Ronnie had not been well for some time and had complained of severe heartache: “The very day he complained bitterly about severe heartache, I rushed him to the Achimota Hospital where he was treated at the emergency unit and discharged on the same day. In a related development, Ronnie Coaches was alleged to have died of “heart problems” at the Korle Bu Teaching Hospital in Accra. He was rushed there on Wednesday for emergency cardiac care. His family suspects the 36-year-old hip life musician of duo – Buk Bak – may have died as a result of negligence on the part of the Hospital. Ronnie’s family say they have heard reports suggesting Korle Bu had run out of oxygen as of the time Ronnie was on admission. Korle Bu, however, insists it had oxygen at the time of Ronnie’s admission. Its Public Relations Officer, Mustapha Salifu told XYZ News that: “No, that cannot be true because we’ve never run short of oxygen during the period that the patient was brought to the hospital”.